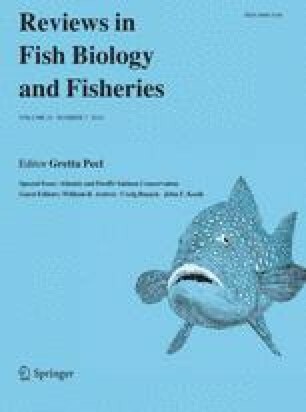 Reproductive tactics and migratory strategies in Pacific and Atlantic salmonines are inextricably linked through the effects of migration (or lack thereof) on age and size at maturity. In this review, we focus on the ecological and evolutionary patterns of freshwater maturation in salmonines, a key process resulting in the diversification of their life histories. We demonstrate that the energetics of maturation and reproduction provides a unifying theme for understanding both the proximate and ultimate causes of variation in reproductive schedules among species, populations, and the sexes. We use probabilistic maturation reaction norms to illustrate how variation in individual condition, in terms of body size, growth rate, and lipid storage, influences the timing of maturation. This useful framework integrates both genetic and environmental contributions to conditional strategies for maturation and, in doing so, demonstrates how flexible life histories can be both heritable and subject to strong environmental influences. We review evidence that the propensity for freshwater maturation in partially anadromous species is predictable across environmental gradients at geographic and local spatial scales. We note that growth is commonly associated with the propensity for freshwater maturation, but that life-history responses to changes in growth caused by temperature may be strikingly different than changes caused by differences in food availability. We conclude by exploring how contemporary management actions can constrain or promote the diversity of maturation phenotypes in Pacific and Atlantic salmonines and caution against underestimating the role of freshwater maturing forms in maintaining the resiliency of these iconic species. An erratum to this article can be found at http://dx.doi.org/10.1007/s11160-014-9354-x. We thank Bill Ardren and John Kocik for the opportunity to participate in the special symposium on Pacific and Atlantic salmon conservation. Early versions of the manuscript benefited from comments by Dan Bottom, Gordie Reeves, and India Sloat. Kathryn Ronenberg provided valuable assistance with the manuscript figures.